Le vendredi 29 septembre 2006. Nous commençons ici la publication (en anglais) d’un mémoire consacré à Daphne du Maurier et au roman L’Auberge de la Jamaïque. Ombeline Belkadi, auteur de ce mémoire, analyse les rapports entre la vie de la romancière, son attachement à la Cornouaille et son oeuvre. Cornwall and its sublime scenery have always attracted thousands of tourists and artists from all over the world in search of a sensation of wilderness and isolation. Today, the county remains almost entirely unspoilt and one can still experience the capricious nature of the elements across the moors, and hear the rocky tors whisper centuries of history and legend in the open moorland. A good many writers have been bewitched by this dramatic landscape, and in spite of the numerous historical and literary books already written about Cornwall, the well known Cornish historian A. K Hamilton Jenkin maintained, in 1932, that "the story of the long shore life of Cornwall, rich as it is in colour, incident, and high romance, has never been told in full by any writer, for the very reason perhaps that its many sidedness and complexity forbid its telling within the limits of any book of ordinary length" . However, at that time, a writer was about to refute this statement and would soon become a legend and make a precious contribution to the Cornish cultural heritage. Daphne du Maurier was rapidly considered to be the literary phenomenon of the county and was made Dame Daphne Du Maurier in 1969 in recognition of her work. Although she was not a true daughter of Corrnwall, she grew to love her adoptive county and immortalized it in novels which easily captured the heart of its readers. Her imagination being constantly set on fire by the county she loved so much, Daphne du Maurier never stopped writing, using Cornwall as the setting for many of her novels. Although her most famous titles were from her younger years, she was still producing novels in her sixties. Indeed, most of her life was dedicated to her writing. Her seventeen novels, nine books (including her biographies), fifty short stories and two plays, which sold in millions, were translated into the major languages and still enthrall different generations of readers. Daphne du Maurier’s love affair with the area was to last for aIl her life, and was passionately declared in her books. Unfortunately, it is only too true that the magic aspect of the fertile encounter between the writer and Cornwall often seems to sum up the major theme of the author’s best sellers. However, as a few critics  have already pointed out, Daphne du Maurier’s writing seems to be the fruit of a far more complex affair, in which the writer’s evolution as a woman played a major role. Interest in her books then requires a certain knowledge of the author’s private life. Daphne du Maurier was born in London in 1907, the second daughter of the actress Muriel Beaumont and Sir Gerald du Maurier, a famous actor-manager of his day who performed plays by writers such as Edgar Wallace and J.M Barrie at London’s Wyndham’s Theatre. She was also the grand-daughter of George du Maurier, himself famous for his career as a cartoonist and author of Peter Ibbetson, The Martians and Trilby. Born into a talented theatrical and artistic family, Daphne du Maurier inherited a vivid imagination which was to be followed by a strong desire to write. Imagination was not only an integral part of the du Maurier’s life, but was also encouraged in all its aspects, as we learn from Margaret Foster’s biography . For example, the du Maurier’s speech was constantly sprinkled wi th code words or nicknames which enhanced conversations with a magical and secret aspect. Like any member of the family, each new friend was traditionally given various nicknames. By the end of her life, Daphne du Maurier herself was either "Bing", "Tray", or "Track" and she used a great number of code words, in any form of communication. This very special language could seem impenetrable and as a result, the family circle often appeared closed and beyond the comprehension of outsiders. However, the delight Daphne du Maurier and her two sisters Angela and Jeanne took in using their imagination never waned for they naturally recreated in private or in public the theatrical world of their beloved father. But soon Daphne du Maurier expressed an obvious need to exploit her imagination more extensively. As Margaret Foster points out, "Daphne, alone of the three du Maurier girls had a fascination with lives different from her own" . However, Daphne du Maurier’s tendency to daydream came as a response to a profound malaise, and to a need to escape an environment she found more and more oppressive. Indeed, Daphne du Maurier strongly suffered from a jealous father who, in contrast to her mother’s lack of tenderness, openly showed affection and refused to see his daughter grow up. Thus, protecting herself from her father’s passionate possessiveness which she could no longer endure became a priority. She also felt smothered by her environment because she hated London which was both associated with her father, and with the inescapable socializing process it required. Moreover, Daphne du Maurier grew up wishing she had been born a boy, conscious of her father’s strong desire to carry on the du Maurier name. Consequently Daphne du Maurier showed a distinct preference for behaving like a boy, and adopted a markedly boyish look. Subsequently, her love life grew complex and tormented, for she had to face her ambivalent reactions towards boys and what she refused to admit but thought could be "venetian tendencies" (her personal transformation of the word lesbian) towards girls. This marked the beginnings of Daphne du Maurier’s longstanding confused sense of her self, a confusion probably reinforced by the emergence of conservative ideas about female identity and conventional attitudes towards women’s role in society. As correctly underlined by Avril Horner and Sue Zlosnik, "she was an adolescent and young woman during a period when ideas about female identity and sexuality were undergoing a radical shift and moving towards a more rigid categorization" . Consequently, she gradually retreated into a fantasy world, became more and more withdrawn and isolated, craving the unveiling of the mysterious thing which could help her feel happier, until she discovered Cornwall and… writing. In the 1920’s, her parents bought a holiday home overlooking the River Fowey. It was, to be precise, on the 13th of Septernber, 1926, that Daphne du Maurier caught her first glimpse of Cornwall, and immediately realized the freedom it offered. The first sight of the house represented the start of Du Maurier’s eternal love for Cornwall. Being still too young after the initial discovery of the house to settle down in Cornwall alone, she spent the first holidays in Fowey with the family, and did not instantly enjoy complete freedom. Instead, she enjoyed hours of walks in the countryside whatever the weather or devoured books as she had always done from her earliest years. Indeed, Daphne du Maurier had not only been fascinated by the magical theatrical world in which she had grown up, but had always been captivated by the freedom of imagination provided by books. J.M Barrie, one of Gerald du Maurier’s great friends, literally enchanted the girl with his works of imagination . Peter Pan, which had been especially written for Daphne du Maurier’s cousins, delighted the girl and she "identified totally with his creations of fantasy lives"  After she read Robert Louis Stevenson’s Treasure Island when she was eight, her interest in books never faded, her readings included a wide range of authors such as Charles Dickens, George Eliot, The Brontës or Katherine Mansfield. In Du Maurier’s opinion, Cornwall was the ideal place to let her imagination flow  and she was definitely convinced that if she could stay in the holiday house on her own, she would fulfil her deepest wish : to write. After endless negotiations with her parents, the young Daphne was at last permitted to stay in Cornwall alone, on condition that she managed to become financially independant thanks to her writing. This was a real challenge and Daphne du Maurier seized the opportunity. 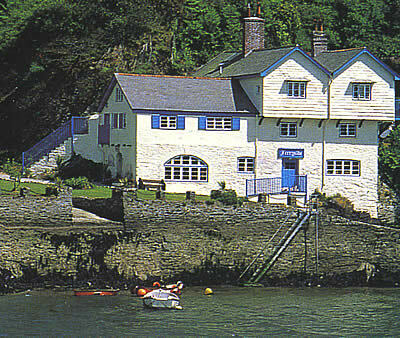 So, the discovery of the boat-house named "ferryside" changed Du Maurier’ s life for ever. Once she was alone in Cornwall, she explored the countryside as much as possible and disciplined herself to combine her writing with her outings. Within a few months, she had already completed a set of short stories. These were not her first efforts, but they presaged the young woman’s future career. The following years were to bring her initial success with the publication in 1931 of her first novel, written in three months when she was only 23 : The Loving Spirit. From that point on, she wrote at an astonishing rate, and it was for the stories set in Cornwall that she became world reknowned. Piers Dudgeon’s foreword to Daphne du Maurier’ s Cornwall , makes us aware that "Cornwall met the challenge of her developping imagination in a creative fashion". Indeed for Daphne du Maurier, creation and freedom were indissociable, and it is in Vanishing Cornwall, one of her non-fiction books, that she revealed, years later, her deep attachment to Cornwall confessing that, "here was the freedom I desire, long sought for, not yet known. Freedom to write, to climb hills, to pull a boat, to be alone" . Later, when Daphne assumed her various roles as a wife, a mother and what she called a "career woman", Cornwall became more significant than ever, principally for the special freedom it represented. She stayed in Cornwall until her dying breath, mostly because she felt free to write but also because, far from the public eye, she could let out her true identity, "neither girl nor boy but disembodied spirit dance in the evening when there was no one to see" . As a consequence, the make-believe world of Daphne du Maurier more freely ernbraced her writing. From the early stories, Daphne had found a way to explore various personal issues through her writing, notably the boundaries between men and women, and she eventually expressed her deepest thoughts on the nature of love, questioning the balance of power in marriage and society. ln fact, if Cornwall provided the inspiration for her novels, Daphne du Maurier also covertly fuelled her writing with sorne intimate aspects of her private life. Thus, for Daphne du Maurier, writing became a means of externalizing the malaise linked to her fractured identity, a way of analysing her anxieties. Daphne du Maurier’s writing was therefore the fruit of deep reflection, also likely to raise the issue of women condition. Unfortunately, this aspect of her writing was ignored by most critics and readers, for her reputation, largely built on her best known novels, tended to freeze her within a certain categorization. She was constantly associated with the romantic landscape of the county she so beautifully depicted. As a result, in the minds of sorne critics , Daphne du Maurier was merely a romantic novelist. Underlining the popular appeal and the romantic glamour of her work, the critics’ approaches to her writing were far from what she expected them to read. The covers of her books too, still rernain largely sentimental and are generally shelved in bookshops among ’cheap’ popular fiction. Although the films inspired by her novels have become cinema classics, (Rebecca, The Birds, My cousin Rachel, Frenchman’s Creek … ) some of the cinematographic adaptations reflect the writer’ s reputation, being exaggeratedly romantic and this did not always please the writer. For example, Foster recalls that Daphne du Maurier hated what Hitchcock had made of Jamaica Inn , "Instead of being violent and ugly, they [the wreckers] had been made into Peter Pan pirates, and the effect was quite opposite of her intention". ln fact, it seems that Daphne du Maurier’s novels were mostly read on a superficial level and consequently, the critics often failed to detect any psychological depths to her writing. For example, although Daphne du Maurier’s most popular novel, Rebecca, was widely read and almost met general approval, the study of jealousy, the major theme of her book, had scarcely been noticed . ln a letter to Oriel Malet, Daphne du Maurier wrote about her twelfth novel, The Scapegoat, and also deplores that "the psychological politics, and the religious significance […] will be only seen by the few, and that most people will read it as a semi-thriller". Then, referring to the main character, she supposes he would be perceived as "a chap involved with a crowd of women ". In fact, the general misunderstanding of her works sadly extended to the readers’ apprehension of her novels. Daphne du Maurier, who once vigorously affirmed that she was not a romantic writer  was neither, at least for sorne critics , a talented and serious writer. However, the study of Jarnaica Inn tends to refute the latter comment. Indeed, behind a strongly atmospheric tone and an exceptional writing style, Daphne du Maurier’s subtext is as fascinating as the surface story and undoubtedly demands a close analysis, as is precisely the case for Jamaica Inn. Jamaica Inn, published in 1936, was Daphne du Maurier’s fourth novel. This adventure story, set in Cornwall, is centered around the smuggling activity of 1815. The writer clearly presents her intention to write an imaginative tale from the very first page of the book, commenting that, "although existing place-names figure in the pages, the characters and events described are entirely imaginary" . But despite the imaginative nature of the novel, the reader enters readily into the writer’s Cornish world, weather, landscape, and becomes emotionally involved "within the limits of [a] book of ordinary length" . However, Daphne du Maurier, contrary to Hamilton Jenkin, never intended presenting Cornwall exclusively from a historical point of view. Instead, it is thanks to her imagination, and the inclusion of some aspects of reality, that the Cornwall she writes is emotive, and makes a strong appeal to the reader’s sensibility. It then becomes obvious that the interest in the novel lies primarily in the study of the devices used by the writer to draw the reader. The writer’s narrative technique logically allows the reader to appreciate the affective power of the texte. And a more detailed analysis of the text may also reveal its numerous links with the Gothic genre, possibly used as a means to raise the issue of gender. Finally, a last approach to Daphne du Maurier’s writing would inevitably focus on the symbolic level of the text, because of its richness, complexity and possible connections with the writer’s own intimate perception of reality. The exploration of Jamaica Inn’s different levels of reading could possibly reinforce the idea that Daphne du Maurier’s works, without being necessarily autobiographical, may have largely contributed to the author’s self-evolution and definitely enabled readers to discover a writer of great skill. Jenkin, A.K Hamilton. Cornwall and its people London ; David and Charles INC, 1970.
 ln fact, very few critical works and serious studies exist on Daphne du Maurier and her writing. Interesting elements about Daphne du Maurier’s relation to her writing most notably appear in Margaret Foster’s biography : Foster, Margaret. Daphne du Maurier, London : Chatto and windus, 1993. and in the recent study of du Maurier’s writing in connection with the Gothic genre : Horner, Avril and Zlosnik, Sue. Daphne du Maurier, Writing, Identity and the Gothic Imagination, ST. Martin’s press, INC, 1998. Horner, Avril and Zlosnik, Sue. Daphne du Maurier. Writing. Indentity and the Gothic Imagination. ST. Martin’s Press, INC, 1998 (14). Daphne du Maurier Cornwall. Her Pictorial Mefioir Ed. Dudgeon Piers, 1995. (8). Foster, Margaret. Daphne du Maurier London : Chatto and Windus, 1993.(22). Daphne du Maurier, Vanishing Cornwall Harmondsworth : Peguin Books, 1972.(6). Daphne du Maurier Cornwall. Her Pictorial Mernoir Ed. Dudgeon Piers, 1995.(11). Extract of one of Daphne du Maurier’s Ietters to her intimate friend Ellen Doubleday, dated from 10 December 1947, quoted in Margaret Foster’s biography of Daphne du Maurier. (222). Daphne du Maurier was commonly defined as "the world’s most popular romantic novelist" as quoted in Foster’s biography,( 415) a label still used today by the tourist industry of Cornwall. Daphne du Maurier overtly deplores the misinterpretation of her books in her interview with the journalist Cliff Michelmore. Cliff, Michelmore. The make believe world of Daphne du Maurier. Banner Pictures. Letters from Menabilly. Portrait of a friendship Ed. Oriel Malet, London : Orion Books Ltd, 1994.(80). Interview with Cliff Michelmore. The Make believe World of Daphne du Maurier, Banner Pictures. Avril Horner and Sue Zlosnik’s researches reveal that Daphne du Maurier’s writing was even once compared to "a glossy brand of entertaining nonsense", in the words of Ronald Bryden, quoted in The Spectator n°20, April 1962 (515-514). Daphne du Maurier, Jamaica Inn, London : Arrow Books, 1992 (introductory note written by Daphne du Maurier in 1935). Jenkin, A.K Hamilton. Cornwall and its people London : David and Charles INC, 1970 (2).